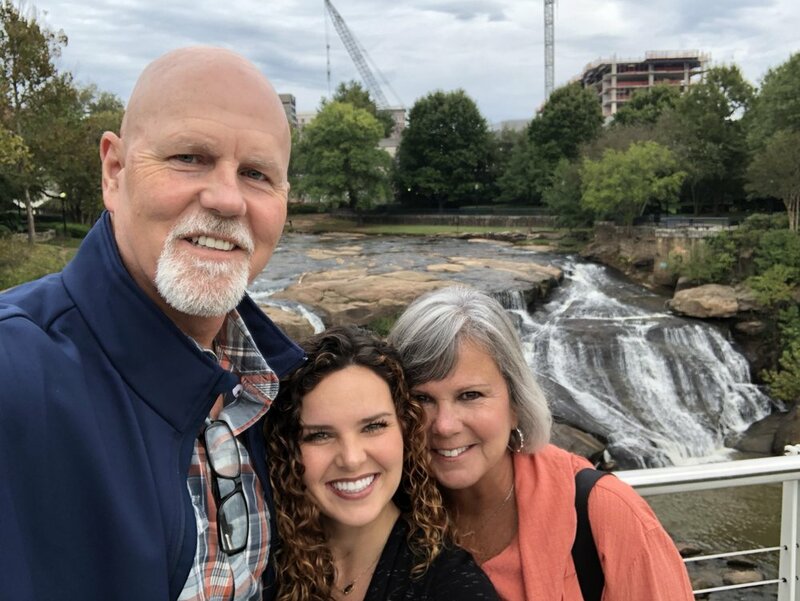 If you’re in the greater Greenville area and looking to get outside, here are some spots you simply CANNOT miss. The beauty that God places all around us, but specifically outdoors, deserves to be marveled daily. This is in downtown Greenville. How did I get so lucky to land in this gorgeous place?! One minute you are window shopping or eating lunch and then you stumble across a gorgeous waterfall and suspension bridge. This place, man. It doesn’t get old. I can remember Hunter bringing me here the weekend that he asked me to be his girlfriend. My, how things have changed since then. Who knew we would end up living in South Carolina!? It sure it crazy how fast things can change. If you stop here, be sure to grab coffee or homemade ice cream from Spill the Beans and then walk the trail around the falls! This hidden gem is about 30 minutes outside of Greenville and it is worth the drive. 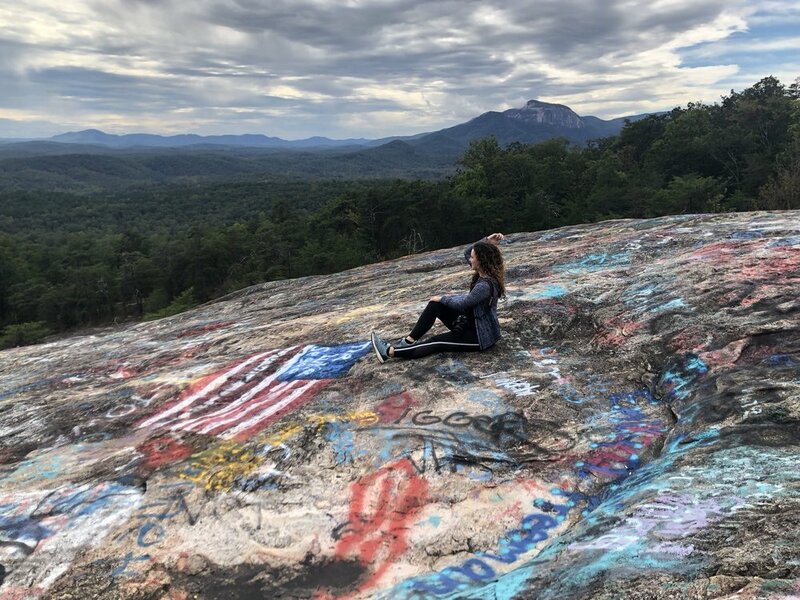 The giant, flat rock boasts more graffiti than all of New York City and oddly enough, the vandalism creates a striking contrast with the beautiful panoramic nature views. Careful though, there’s a steep drop-off. And don’t get any funny ideas, the fine is $500 for every can of spray paint you are caught with. Yikes. We bought the BEST local honey, blueberry preserves and pickled okra from a man who sells his produce and canned items near the bridge that leads to this pretty spot. I highly recommend going to Bald Rock, buying blueberry preserves and eating them on a big, buttery biscuit the next morning. Our souls were very content that weekend. This forest has the most gorgeous waterfalls I have ever seen. We hiked 1 mile to get to this one, but there are several others with more strenuous hikes if you’re up for it! It takes about 45 minutes to get here from Greenville but the drive is absolutely stunning. You’ll pass several country restaurants and ice cream shops so I suggest taking it easy and stopping to eat and hangout along the way. At an elevation of 3,208 feet there’s not much you can’t see a this state park. You can even make out downtown Greenville if you look closely. No words can do justice to this gorgeous view, especially in the fall. It is really easy to take in this scenery, because you can park and walk right up to it. No hiking involved! If you go, be sure go down the creepy stairs to the Devil’s Kitchen because once you come out of the other side you’ll be able to see the profile of Caesar’s Head. Very cool. If you’re ever in town, you better let me know! I would love to be your personal tour guide or give you ideas of things to do. Hopefully this list will give you some good options to help you enjoy the great outdoors. If it’s cold or raining, just give it up and go shopping.